A well-formed slice of noir mystery, beautifully presented. Some writing issues aside, A Case of Distrust is well worth your time. What is it: An adventure game about a P.I., set in prohibition-era San Francisco. You're Phyllis Cadence Malone, a former cop turned private eye in 1920's San Francisco. With a name like that, how could you be anything else? Malone's latest case comes courtesy of a local bootlegger. He's received a death threat, and hires her to confirm his suspicion that the sender is a rival gangster trying to interfere with his sale of a new supply of hooch. It's up to you to chase down the truth. 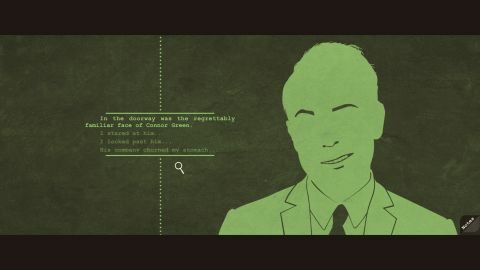 A Case of Distrust is an adventure game about clues and interrogation. It looks gorgeous—each screen a block of colour given life by silhouettes and the stylish transitions that link each scene. You gather evidence by clicking on the highlighted objects in each room, and take statements by talking to people of interest. Any pertinent information (and more than a few red herrings) are collected in your notebook. Present the right information to the right people and you'll unlock new leads—a place, a witness, maybe even a culprit. During the investigation, characters are almost all archetypes – the aloof fixer, the surly kingpin, the easygoing bartender. The formula works, though. A Case of Distrust wields its setting and genre to great effect. My favourite conversations, though, take place during taxi rides between locations, as you and the driver talk about the state of the world. These slice-of-life historical chats cover everything from transportation—blimps!—and Egyptomania to the plight of immigrants, and are usually fascinating in how they convey the excitement and possibilities of the era. Throughout, Malone reflects on what she sees, and you can help define her outlook through branching dialogue options. In some respects, there's not much to her character. She's the world weary protagonist of a noir mystery, with all the emotional baggage that implies. But sticking rigidly to the genre's cliches proves an effective means of highlighting the casual sexism of the era—an underlying facet of your interactions throughout. Malone's internal monologue upon seeing or experiencing discrimination can feel clinical, and not in a way that comes across like a deliberate character choice. To the player, it's clear that Malone is a shrewd, dogged investigator, with the trademark jaded outlook and troubled past that typifies any fictional detective. To the people she interacts with, though, Malone is a curiosity; a woman in a man's world. She is belittled and underestimated – rarely overtly, but it's evident in the occasional snide remark and insensitive action. Malone is even accused by the wife of her client of being his mistress, as if there was no other possible explanation for their meeting. Such moments feel more pronounced precisely because of how neatly she fits the P.I. archetype. That's not to say there aren't problems. Specifically, Malone's internal monologue upon seeing or experiencing discrimination can feel clinical, and not in a way that comes across like a deliberate character choice. It's as if, in the effort to make explicit parallels to the present day, a sense of her as a person is lost. It's a small thing – A Case of Distrust is economical with its language throughout, sometimes to great effect—but it detracts slightly from the impact of these moments. At three hours long, A Case of Distrust is slight but satisfying. It's not immune from the standard adventure game problems, though. At one point, I became stuck because I missed a piece of evidence. It was my own fault, sure, but not knowing how to proceed highlights the uneasy alliance between adventure and investigation. At first, interviews seem like tense negotiations where the subject could clam up at any moment. That feeling soon disappears when you're left asking about every item in your notebook, hoping for a lead. And the character explicitly introduced as someone Malone can seek advice from when stuck proved wholly ineffective – even suggesting I probe deeper into a lead that had nothing to do with the actual solution. Still, the mystery is engaging, and resolves in genre appropriate fashion. Malone's interactions, though basic, are enjoyable—a fulfilling loop of gathering information and using it to put the squeeze on suspects. Moreover, A Cast of Distrust feels atmospheric and evocative—its unique look and sense of style creating a compelling period drama that cuts through the few small missteps and frustrations.